It’s common knowledge that Steve Jobs, co-founder of Apple back in the seventies, was ousted from his own company; only to return several years later and take the company from its knees and on the brink of collapse, and help it grow to become the world’s most valuable company. It’s a fascinating story, and one which will be documented to great length in the upcoming movies based on the life and times of the late, great Cupertino leader. 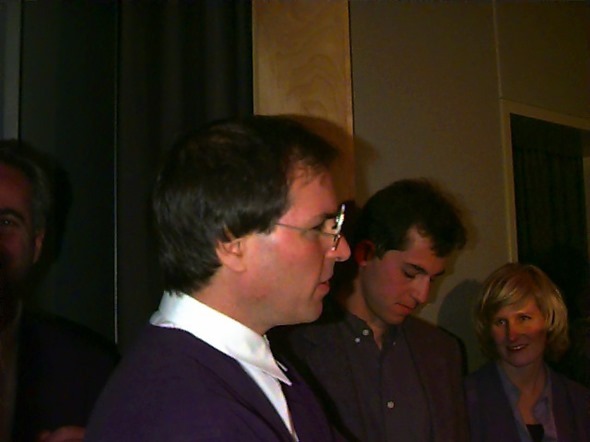 As anticipation for the first movie, entitled jOBS, which hits cinemas very soon, there’s likely to be a noticeable increase in Jobs-based coverage, and to kick things off, ex-Mac OS fanboy Tim Holmes has uploaded some interesting pictures of the moment Jobs returned home. 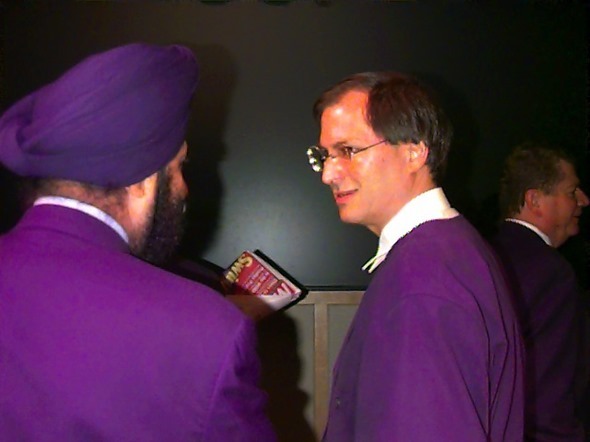 It was December 1996, and Jobs arrived at a pretty desperate company promising some big improvements to what was quickly becoming a dying brand. 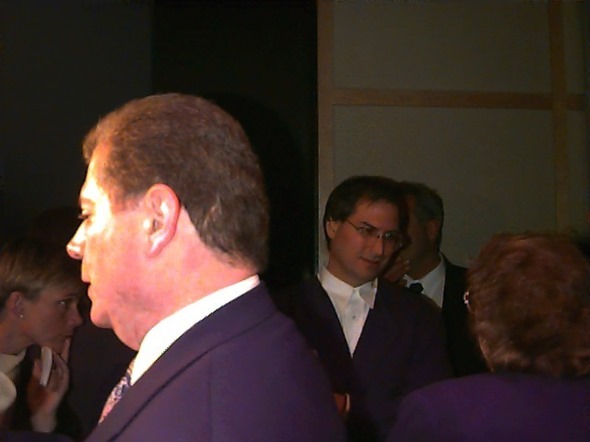 Holmes recalls working late on the Friday before Christmas, and at one point, his manager rushed to his office door, urging him to follow him to Town Hall, where Apple held its big announcements at the time. "It was clearly not a company meeting . . . I called Mitch, my wife who also worked there at the time, and told her meet me there. We had no idea what was about to happen." 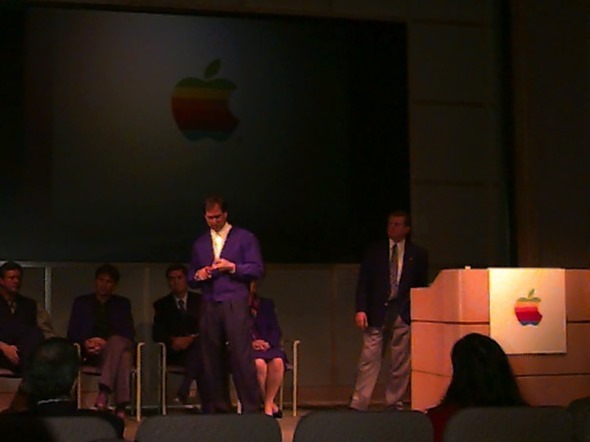 Using one of Apple’s QuickTake digital cameras, he took quite a few shots of the event. 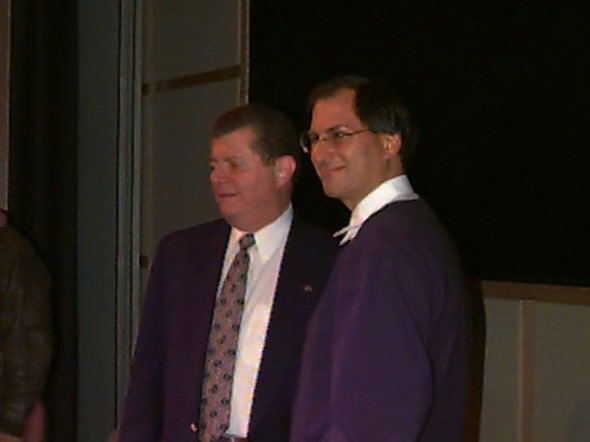 Although it may looks as though Jobs was dressing up for a Prince tribute concert, the jacket he was wearing was actually black, not the bright purple hue portrayed in the shot. It’s little wonder Jobs swiftly dropped the QuickTake camera soon after – almost as quickly as he swapped his corporate attire for his trademark polo neck, Levi Strauss 501s and New Balance trainers. In his later years, Jobs always gave the impression of a strong-minded, charismatic leader, but as these images reveal, in times of genuine uncertainty, there was a much more vulnerable side to the late, great helmsman. Having revolutionized the digital music, smartphone and tablet markets, the company is now as strong as it has ever been, but it is thanks largely to Jobs that the company even remains in existence.